Narcisse-Périclès Rigaud (Rigau or Rigaux) and his sister Antonia were the children of General Antoine Rigaud, one of Napoleon’s officers. They joined their father in the 1818 Bonapartist attempt to form an armed colony in Texas called the Champ d’Asile (Field of Asylum). 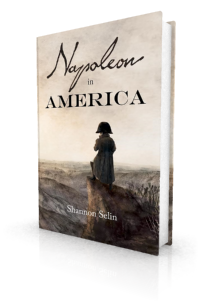 Narcisse’s distaste for Charles Lallemand in Napoleon in America stems from his experience at the colony. Antoine Rigaud was born to a family of modest social position at Agen, France on May 14, 1758. In 1779, he joined the French army as an infantry private. Promoted to captain in 1792, he fought in many battles of the French Revolutionary Wars. He subsequently participated in Napoleon’s campaigns in Italy and Austria. Rigaud acquired a reputation for bravery in combat, attested to by numerous wounds, including a shot through his jaw that left him almost unable to speak. For his service at Austerlitz he was decorated with the cross of the Legion of Honour. In 1807, he was made a general of brigade, and, in 1808, a baron of the Empire. Narcisse-Périclès – born at Lille on May 20, 1794. Anne-Joseph died in 1804. The following year Rigaud senior married Marguerite Probst (1781-1865), with whom he had a daughter, Marguerite Antoinette Eugénie, born on March 21, 1806. She later became the wife of 19th century French politician and industrialist Charles Kestner. Dieudonné and Narcisse followed in their father’s footsteps and became soldiers. Narcisse graduated from the Saint-Cyr military academy in 1812. As his father’s aide-de-camp, he fought at the Battle of Dresden in August 1813, during which he was wounded. In 1814, Narcisse became a captain. General Antoine Rigaud was well treated by the Bourbons after Napoleon’s 1814 abdication. Louis XVIII named him head of the Department of the Marne. Nonetheless, Rigaud rallied to Napoleon when the Emperor escaped from Elba in 1815. Rigaud sheltered General Charles Lefebvre-Desnouettes after the failure of the latter’s plot to take the La Fère arsenal with Charles Lallemand. Rigaud also liberally distributed drinks to two passing royal regiments, thus inducing them to desert to Napoleon. He took the money for the drinks – 10,000 francs – from the local civil administration, a charge that was later used against him. (1) Once in Paris, Napoleon confirmed Rigaud’s appointment as commander of the Marne. In July 1815, after Napoleon’s final abdication, General Rigaud was captured by the Russians at Châlons-sur-Marne. His captors took him to Frankfurt, where he was later freed. Unable to return to France – he was proscribed by the Bourbons in the ordinance of July 24, 1815 – Rigaud went to Sarrebruck. Dieudonné (a cavalry colonel) and Narcisse joined him. The Rigauds began to circulate seditious pamphlets among the French troops stationed across the Rhine River, encouraging them to desert. On May 16, 1816, General Rigaud was sentenced to death in absentia. When the French government began extradition proceedings against him, he fled to the United States with Narcisse and Antonia. Arriving in New York in November 1817, the Rigauds joined the Lallemand brothers’ planned expedition to found an armed colony in Texas (then under Spanish control) called the Champ d’Asile. General Antoine Rigaud helped Charles Lallemand recruit colonists from among the expatriate French soldiers along the east coast. On December 17, 1817, the Rigauds left Philadelphia on a hired ship, the Huntress. They were ostensibly bound for Mobile, but actually headed for Galveston. General Rigaud was in charge of the 80-90 men on board. Once the colonists were in Galveston, pirate Jean Laffite was compelled to put up with them as they outnumbered and outgunned his followers. As the group waited for Charles Lallemand and his men to join them, Rigaud had difficulty maintaining discipline, a harbinger of later troubles. Once Lallemand reached Galveston in March 1818, the group headed up the Trinity River to the present location of Moss Bluff, south of Liberty. Some of the men went by boat with Lallemand; this group also carried the provisions. The bulk of the force, under Rigaud’s command, took an overland route. Lallemand’s party got lost in the wetlands and took six days to arrive. Rigaud’s men, who had only three days’ rations, went hungry. Food shortages continued over the next two months, until Lallemand worked out a reliable system for bringing food up from Galveston. Antonia was notable for being one of only four women at the Champ d’Asile, among some 150 men (there were also four children). Once in Louisiana, the Rigauds settled in St. Martinville. Narcisse set up a business which grew prosperous enough to have two employees. Antonia became a teacher in a private home. General Antoine Rigaud died on September 4, 1820 of yellow fever. According to Dieudonné, Narcisse also died “in exile,” sometime before 1846. (8) Antonia – referred to by Dieudonné as his father’s Antigone – married a man named N. Dubois. She died in Paris on September 1, 1871. 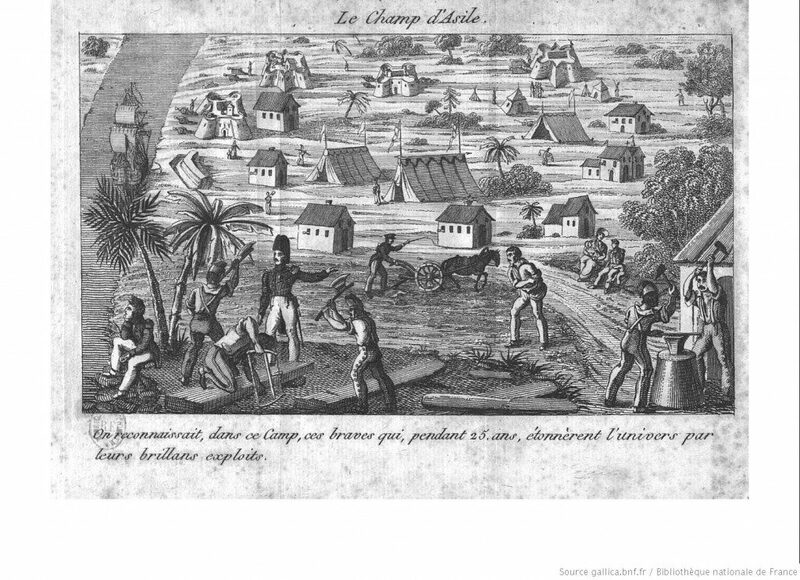 For more about the Champ d’Asile, see the article by Kent Gardien and Betje Black Klier in the Handbook of Texas Online. Rafe Blaufarb, Bonapartists in the Borderlands: French Exiles and Refugees on the Gulf Coast, 1815-1835 (Tuscaloosa, 2005), p. 88. Hartmann and Millard, Le Texas, ou Notice historique sur le Champ-d’Asile (Paris, 1819), p. 40. Jack Autrey Dabbs, “Additional Notes on the Champ-d’Asile,” The Southwestern Historical Quarterly, Vol. 54, No. 3 (Jan. 1951), p. 355. Hartmann and Millard, Le Texas, ou Notice historique sur le Champ-d’Asile, pp. 106-107. Guillaume de Vaudoncourt, Quinze années d’un proscrit, Vol. 2 (Paris, 1835), pp. 287-288. Dieudonné Rigau, Souvenirs des Guerres de l’Empire (Paris, 1846), p. 308. Mademoiselle Rigaud was notable for her tender attachment to her father; she was a model of piety and filial love. One could not set eyes on her without finding himself better, without feeling the desire to be like her, without resolving to imitate her.